I have recently been asked by a well-known broadcasting organist to undertake a recording of a Wurlitzer pipe organ in an auditorium. My first thought would be to use a spaced pair, or perhaps an ORTF pair, far back in the auditorium to take in the acoustics, and maybe another mic or two next to the pipe chambers for the definition of the percussion and so on. But I'm not sure about distances of mics or accounting for the delays between them. I'd like to know if I'm in the right ball park, or a long way off. The multi-capsule Soundfield mic is a popular choice for all kinds of location recording. Technical Editor Hugh Robjohns replies: As I'm sure you know, no two Wurlitzers are ever exactly the same, and certainly no two halls are the same, so I'm afraid I can't offer any exact information for you. It really is a case of going by ear. The ORTF approach is generally a good one, although a lot of people like to record organs using true coincident pairs. The multi-capsule Soundfield mic is also a common favourite for this kind of job. As to distance, it all depends on the acoustics of the hall (in other words, the Critical Distance) and what kind of perspective you require in the recording, which may change with each item performed, of course. The Critical Distance (abbreviated to Dc) is the point, measured from the sound source, at which the direct signal and the reflected or reverberant signal are of equal intensity. To find the Critical Distance, you'll need to use a long tape measure, a sound level meter and some means of generating a reasonably constant level of sound in the room. It doesn't need to be at PA levels — something approaching the spoken voice will be fine. You could use a radio tuned to a heavily compressed commercial pop music radio station, for example, but a decent active speaker and a source of pink noise would be better. Start by measuring the noise level about 10cm in front of the speaker and make a note of the reading. Then double the distance to 20cm and measure again. The noise level will have reduced by something between 4 and 6dB because we are in the direct field where a doubling of distance results in a halving of level. You then keep doubling the distance and measuring the drop in level from the previous position, so measure the level at 40cm, 80cm, 160cm, 320cm and so on. While you are within the direct field, each doubling of distance results in a level drop of between 4 and 6dB, but as you near the point where the direct and reverberant fields are equal in level, the level drop will get much smaller — a change of only a decibel or two indicates that you have found the Critical Distance. Further increases in distance will result in no significant change in level at all, because you are now in the reverberant field. As you move away from the source, the closer to the Critical Distance you place the mic(s), the more reverberation you will pick up. Moving the mic(s) closer to the source will result in a drier signal. Normally, an ORTF array using cardioid mics would need to be placed at roughly Dc/2 (half the Critical Distance), and a spaced pair of omnidirectional mics would be placed at something like Dc/3 (one-third the Critical Distance). In general, organ lofts and pipework are built fairly high, and so a very tall mic stand or two help to get the mic(s) on axis to the pipework. It's then a case of moving the mic around to get the best balance you can between the different sections. If the pipework is installed in multiple locations, you may need to use several mics to cover everything to attain the best balance. 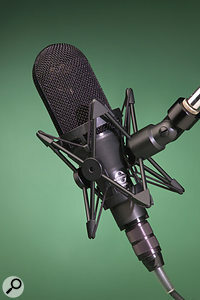 In this case, you may well be able to achieve an acceptable stereo effect using separate, panned, mono mics instead of (or in addition to) a stereo pair. Personally, I tend to go for a main stereo pair to give the best overall balance and acoustic impression of the room, and then add additional (usually) mono mics if needed to reinforce a particular section, just to provide a little extra clarity or definition.